The Princess Party is one of the most popular kids parties ever, so our big list of Princess Parties only includes the best birthday party planning ideas submitted by parents around the world. 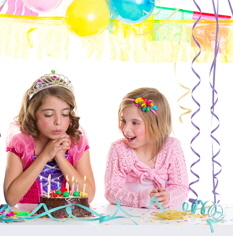 Read through the Princess Party Ideas and incorporate the best birthday party ideas into your party. Create your own party plan and remember to include invitations, decorations, games, activities, party food, beverages, party cake, party snacks, gift bag favors, costumes and gifts. And don't forget to check out The Princess Party Super-Page! It saves you time by organizing all the best ideas for a great family fun party! Magic Mirror Princess Party -3yr- The Mirror Talks!